It’s hard to believe that the first time we were able to see the Earth in full-view was a photo taken a little less than 42 years ago, by the the Apollo 17 astronauts in December of 1972. 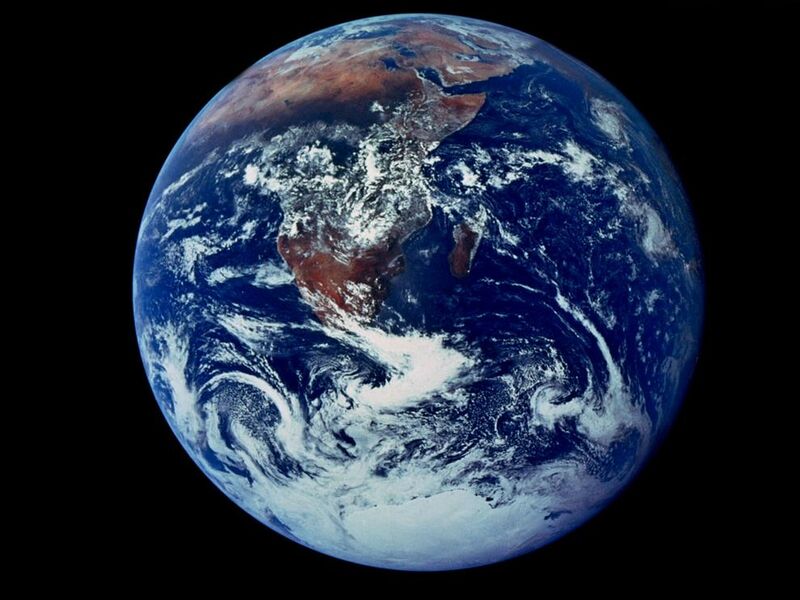 This Blue Marble image that changed our view of who we are, allowing us to see ourselves from the outside as a whole, and became part of our worldview. It is an image that is so powerful that we immediately absorbed it and it seemed as though it had been with us forever. Yet it is a relatively young image for us. From looking down on Earth from space, many astronauts have had an experience that has been called the Overview Effect. It is a sense of awe and sudden understanding as they see the relationship of all things on the planet to one another and how little protects us from the harshness of space. They sense that we are all interconnected and all actions effect the whole. It is a mind-altering view. There is a website called the Daily Overview that has a film that, with the help of several astronauts, t describes the Overview Effect . 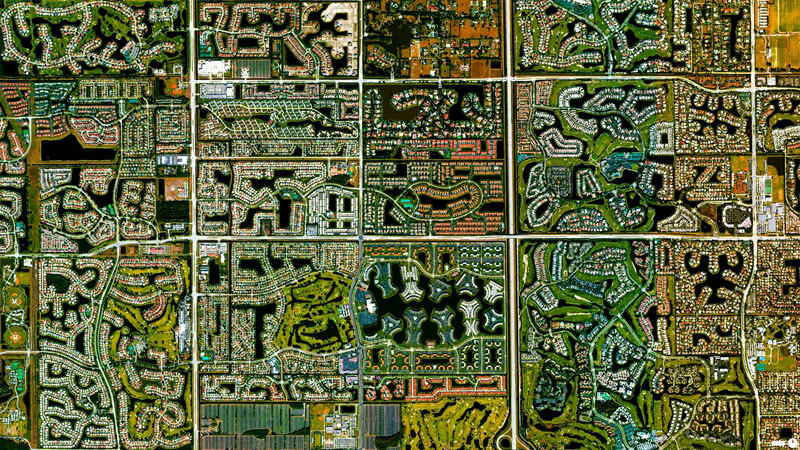 The website also features striking shots of Earth taken from satellites on a daily basis. 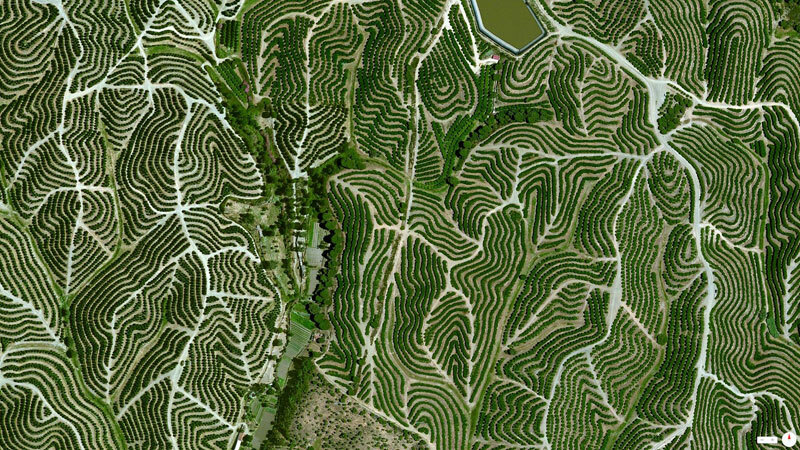 Most of the images are of man’s transformation of the environment , some startling in the way they scar the face of our planet and others with a highly patterned beauty. I have always been attracted to overviews of the landscape, to take that different perspective, so this is a natural for me. I believe this is as close to being an astronaut than I will ever be. Check out their site to see many, many more views. 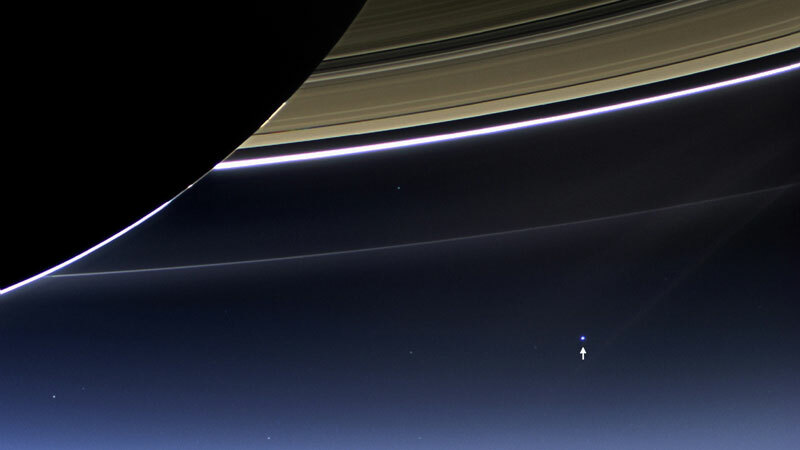 When I saw this recent photo taken from the Cassini Spacecraft capturing Saturn and its rings as well as our own little blue speck of a planet, all I could think of was how utterly trivial my own worries and concerns were in the scope of all things. I guess that can be a frightening thing, to feel so small and insignificant in relation to the universe, to realize that you are but a grain of sand on an immense beach filled with more grains of sand than you can possibly imagine. But to my surprise, I am not frightened. If anything, I am pacified, knowing that I am but a grain of sand subject to forces beyond my control. And a grain of sand cannot alter the beach or stand up to the force of the ocean. It goes where the tide carries it, where the wind blows it. What good is worrying to a grain of sand? So, go with the flow today. We are all grains of sand and should enjoy our time on this beach while the sun shines down on us. After yesterday’s post, one that featured a NASA photo of Rhea, a moon of Saturn, I was asked by Clint from the Principle Gallery if perhaps I might be doing some outer space themed paintings in the future. I really hadn’t given it much thought , to be honest, but I suddenly remembered a few pieces I had painted many years ago, long before I ever thought of showing my work in public. They were experiments, the sort of thing I often worked on then when I was working out color and form. Abstractions, really. Most were pretty bad. But there was one that I always really enjoy when I stumble across it when browsing through a bin of old work. Shown here at the top, this piece from 1994 has Third Stone From the Sun written on a corner. 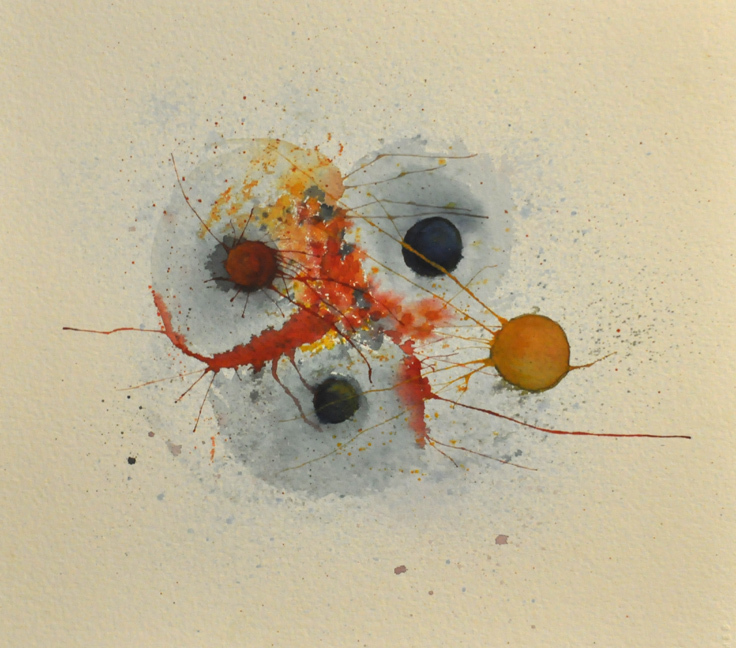 It’s a watercolor that was purely an exploration of color and shape. When I was done it struck me that it had the feel of some sort of galactic apocalypse, as though our Earth had suddenly decided to linejump Mercury and Venus to get closer to the Sun and this was the result. It’s not a great piece but it makes me happy despite the obvious downside to the situation it depicts. At the time, I remember that it made me consider following this abstracted path but I opted to follow the one that has led me here. I often wonder what I would be doing at this moment had I chosen that path. Probably not writing this. But you can’t linger too long over such questions because you will never know. The paths through time fade quickly behind us. Here’s the song that inspired the title, Third Stone From the Sun. It’s classic Jimi Hendrix in a mellow form. I am always stunned by the photos sent back to us from our robotic spacecraft as they explore our solar system. 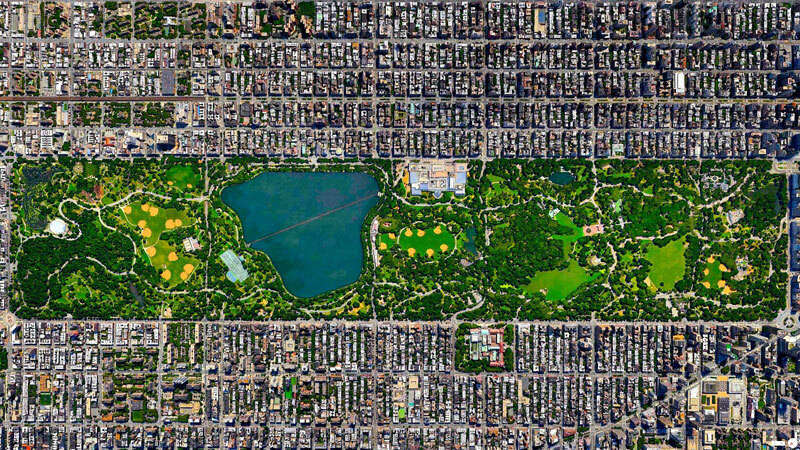 The sheer beauty and magnitude of these images really puts our own world into a different perspective, one that is humbling to say the least. 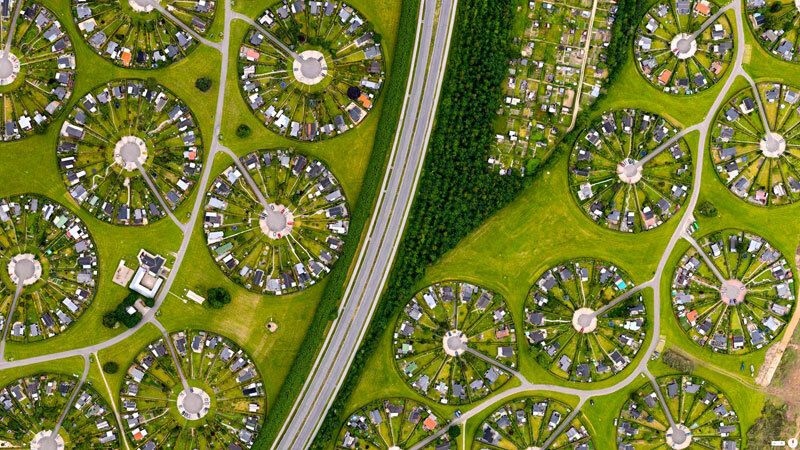 The vastness of these shots makes our personal concerns seem small and insignificant yet, at the same time, inspiring.There’s also an elegance to them that is so appealing. I can’t explain this fully so early in the morning. This photo from a few years back is one of my favorites. Take from NASA“s Cassini-Huygens craft which is exploring around Saturn, this image is like a beautifully constructed abstract painting with cool colors and stark geometry. Beautiful. 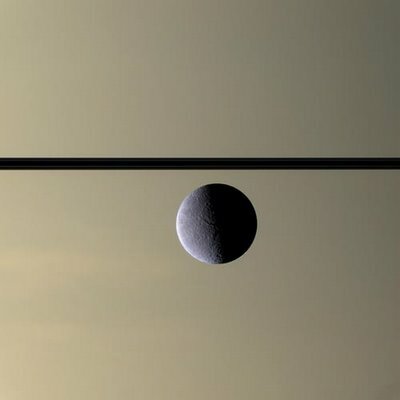 The image consists of one of Saturn‘s moons, Rhea with the gray atmosphere of Saturn acting as a backdrop. The image is taken in a way that looks directly at the very edge of the rings of Saturn which creates the black band that cuts across the image. 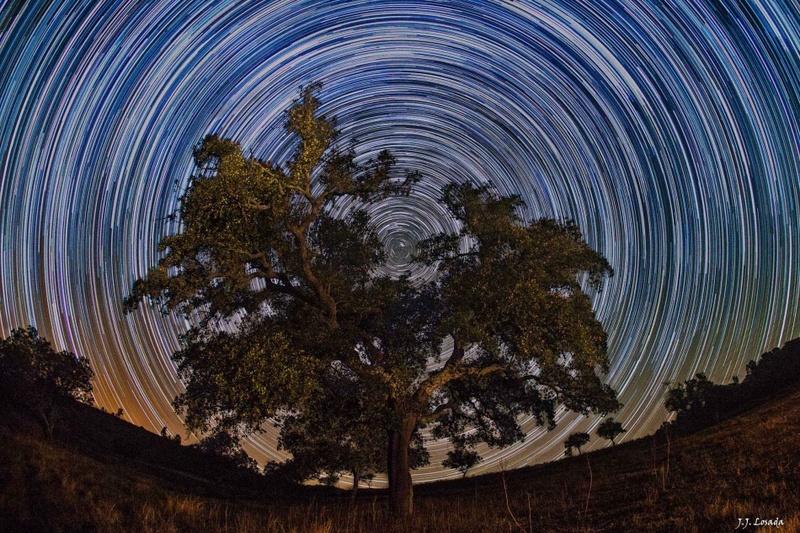 The result is just a beautiful image, one that I find myself just staring at for long moments at a time while I consider how we fit into this vast puzzle.